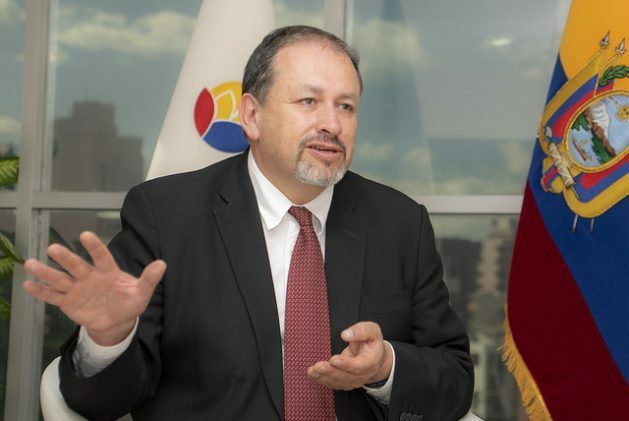 QUITO, Jul 20 2018 (IPS) - Ecuador has decided to move towards a bioeconomy-based development model, “which must be sustainable,” because otherwise “the remedy could be worse than the disease,” said the country’s Environment Minister Tarsicio Granizo, who is spearheading this innovative approach. In this interview with IPS, Granizo explained that the proposal represents a response to an extractivist model which cannot be followed forever. His ministry is working hand in hand with other ministries, productive sectors and the governments of the 24 provinces of this South American country of 17.7 million people. Ecuador is a megadiverse country, but it is also rich in minerals and fossil fuels. The current model of development is based on its underground riches, but now the aim is to move towards a post-extractivist model, focused on the sustainable use of the country’s biological resources. As a first step, the government is drawing up an inter-ministerial environmental agenda with the support of the United Nations Development Programme (UNDP) to identify the administration’s current environmental actions, in order to design a new cross-cutting strategy. IPS: You’re leading what’s called a transition from extractivism and fossil fuels to the bioeconomy. Why? TARSICIO GRANIZO: The bioeconomy is one of the many ways forward for this country which has an economy based on oil and minerals extraction. There may be other ways out, but let’s remember that we are a megadiverse country and that we have to make sustainable use of our megadiversity, with the highest technology. IPS: What is the future for mining and oil in this model? TG: We are talking about a long-term transition, whether we like it or not we have to continue exploiting oil and mining, we still have important resources in both sectors that support the country. TG: There is a deadline for oil exploitation; and, mining will always be there, but it must be organised. We cannot yet say that we are in a process of transition, we have just started thinking about these new forms of economy that will allow Ecuador to leave behind extractivism one day. Of course, not everything bio is necessarily sustainable, because I can replace oil with another product and run out of that product. The sustainable bioeconomy is based on that: the sustainable use of biological resources, and that includes a circular economy in waste management. IPS: But can you put a timeframe on the goal of implementing the bioeconomy? TG: We cannot… How long will fossil fuels last? TG: Maybe 20 years, but in mining, we’ll have to see how things go for us. Mining revenues have to be greater than the environmental liabilities. In this respect, we cannot yet set timeframes. IPS: What is the bioeconomy model you envision for Ecuador? TG: We are thinking of sustainable bioeconomy as a model for which several elements are necessary: conservation, innovation, investment, and markets. TG: Conservation. Ecuador’s soil is already conserved, through protected areas, protective forests that cover 30 percent of the national territory. Innovation is where we are most concerned, where we still have a long way to go. IPS: How is the sustainable use of megadiversity included? TG: Of course, not everything bio is necessarily sustainable, because I can replace oil with another product and run out of that product. The sustainable bioeconomy is based on that: the sustainable use of biological resources, and that includes a circular economy in waste management. TG: The circular economy is a part of the bioeconomy, for example waste can be a good business and an alternative for those already working as waste pickers. We see examples in many parts of the world where waste management is an option. What arrives at the treatment centres is minimal, everything stays in the factories. Little by little we have to make progress towards that. IPS: They say the bioeconomy will favour the development of the most vulnerable segments of society. Is that true? Why and how? TG: Of course, for example, it is the poor who rummage through and separate the garbage. We need to help them out of poverty and help them become small-scale entrepreneurs and have a better quality of life. We have identified about 500 bio-enterprises; the thing is that most of them are small-scale or pilot projects. We work mainly with the Popular and Solidarity Economy (an economic organisation institutionalised in 2011 in the country, whose members, individuals or groups, are based on cooperation and solidarity). IPS: Is there an example that serves as a letter of introduction to what Ecuador already does in bio-economics? TG: There are projects with guadua bamboo cane to make furniture and laminates. This is a fast-growing, abundant resource in the coastal and Amazon regions, which resprouts easily. It is also very interesting what is happening with vicuña wool in (the province of) Chimborazo. Vicuña wool fetches a very high price on the international market. In this country, Chimborazo is the only place where vicuñas (a South American camelid) are found, and that is why we are in the process of teaching local communities how to shear vicuñas, and to treat and use their wool so that it has added value. IPS: How much does the bioeconomy currently represent in Ecuador, and what share of the country’s GDP is it expected to represent? TG: Currently the bioeconomy represents about 10 percent of the industrial GDP, and we plan to double that in the coming years. TG: We are taking a series of measures, we have created the country’s Bioeconomy Network and the 2015-2030 Biodiversity Strategy, we have created an entity with the Private Technical University of Loja to promote bioeconomic initiatives. We are launching the brand BioEcuador. IPS: Have you encountered resistance in the economic and productive sectors? TG: Fortunately, the ministries of production, mining and hydrocarbons, and foreign trade are very well aligned. We have managed to position the bioeconomy as a state commitment also in the productive sectors. We have also talked with the banks to establish soft credit lines with certain benefits to promote the bioeconomy in aspects such as nutraceuticals (‘nutrition’ and ‘pharmaceutical’ – natural foods that provide medical or health benefits). The concept of bioeconomy is already positioned at the state level. IPS: What are the strategies? TG: To use the rich biodiversity that we have in order to provide economic alternatives for the country. In the bioeconomy we do not rule out the improvement of monocultures, for example we have selected five sectors to work in: oil palm farming, shrimp, flowers, cattle and bananas. We want to reach an agreement with these producers so that they do not expand their agricultural frontier, but improve their productivity within their current range. That’s one aspect. IPS: Since the bioeconomy is a long-term project, how can we ensure that future governments maintain this direction and do not change it? TG: As soon as producers see that the bioeconomy is a real alternative, it will not matter which government is in power. IPS: Is this being established at a legislative and policy level? TG: It is included in the Organic Environmental Code and above all in the 2017-2021 National Development Plan. We are working on the development of public policies. IPS: Environmentalists criticise aspects of the bioeconomy, such as the use of biofuels based on monocultures. What is your view on this? TG: Biofuels have their pros and cons. The problem is that land that should be aimed at guaranteeing food sovereignty is allocated to meet transport needs. IPS: So you don’t rule out biofuels? TG: No. I always say that everything can be done in Ecuador as long as it is done where it should be done and is done properly. IPS: Are there other countries in Latin America looking towards the bioeconomy? TG: There was a bioeconomics summit in Germany (in Berlin in April), attended by some Latin American countries. Several are in our line of sustainable bioeconomy. Others see the bioeconomy as the improvement of their monocultures. We don’t rule out that possibility either. IPS: So, Ecuador is betting on different formulas, not only on the bioeconomy? TG: Of course, we can think about the sale of services; in providing banking services to other countries; and, the sustainable bioeconomy. We have to look for alternatives for post-extractivism. TG: Yes, but sustainable, it must be sustainable, otherwise the remedy could be worse than the disease.